Are you like me…slightly OCD, definitely know how you like things and when that is altered, your focus becomes on that instead of the task at hand? When I introduced myself to you all during our launch week, I mentioned I was a runner. Well, I should say I am a sometimes runner. It is a passion of mine but, unfortunately, when life gets in the way sometimes the passion gets forgotten. Luckily, it has never been completely forgotten. I started running back in 1999 or 2000 (well this time finally not the mandatory high school sports running for conditioning or punishment). I actually ran this time to enjoy. And I discovered a quirk of mine…I CANNOT (all caps just to emphasize my completely disdain for this) stand to have hair touching my neck, face or anywhere on my skin while working out. Like, at all. I will even stop a workout to fix my hair to get it off the area. Yes, it is that bad. So for all but a short period of time when my mom was sure I was having a mid-life crisis, I have had long hair. I always tell my hairdresser to keep it long enough to go in a ponytail so I do not have to deal with the hair when working out. For the past several months I have been training for a half marathon. So, once again, I immediately thought of my hair length and my ability to put it in a ponytail. 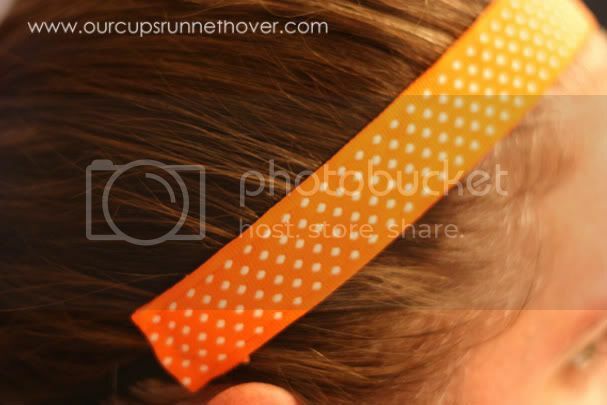 At the same time, my friend and virtual training partner (and fellow Nashville runner), Maria, mentioned that she used a Sweaty Band to hold her hair back. So I, of course, had to immediately check them out. I went to the Sweaty Bands website and, man, they had a lot of choices. Pink, purple, black, with designs, solid, thin, thick…you name it and they seemed to have it. And the best part…they are guaranteed to not slip. I really wanted one but my hang up was the price tag… $15 for a thin band and $18 for a thick band. So I went back and forth, never actually placing an order. The frugal side of me (which usually wins out) was saying Walmart has some that will not be as good but they are a lot cheaper. The spendy side of me told myself to treat myself for all the early morning runs (because getting up at 5:20 a.m. to run deserves some sort of reward, right? :)). I loved it. Yes, I fell in love with a sweaty band…ha. I was just drawn to it and knew I had to have it…so I shelled out the $15 and bought it. And I can honestly say it was one of the best $15 I have ever spent. To say I love it is an understatment. It has become a running must-have for me. Heck, it has become a clean-my-house must-have for me. I wear it a lot, running or just hanging out. The advertisement is completely true to its word. It does not move and needs no readjusting during a workout. I have been running for a long time and this is the first time I can ever say that about a product. Plus, they are adorably cute and could even be used as a headband to go with your latest spring outfit. So, if you are like me and you are slightly OCD, these will be perfect for you. Heck, even if you are much more relaxed than me, these will be perfect for you. If you end up purchasing one, let me know. I would love to see which one you chose! Amy – that shocks me. Did you try it on close to your hairline? It seriously NEVER moves for me. Kristyn – I got mine at Cool Comfort in Frankfort BUT I do believe John’s carries them. I was there a few weeks ago and if I remember correctly I saw them there. Dawn—you mention you can find it at a local running store, but never say which one!!! Is it John’s Run/Walk shop? I may have to check those out. I tried one on at the Princess Half-Marathon Expo, and yep, my head is too big! It kept slipping right off the back of my head. Why oh why must I have such a large noggin? !